Cable TV rates have been hiked by Rs 25 to Rs 40 per month from January 1, following an upward revision in cable TV subscription price ceiling by the Telecom Regulatory Authority of India (TRAI), and a hike in subscription charges by various pay channels. Industrial Area or encroachers’ paradise? It is official now. The Phase I of the Industrial Area is fast emerging as an encroachers paradise with hundreds of encroachments dotting the area, according to a survey conducted by the Municipal Corporation of Chandigarh (MCC) recently. 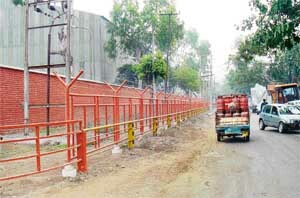 Encroachments by an industrial unit owner in Phase I of the Industrial Area in Chandigarh. tractor-trailer near the railway track in Ram Darbar, Phase II. The throat of an unidentified youth, who appears to be in his twenties, was reportedly slit by 11 persons in Sector 20, during wee hours today. The victim’s throat was slit and he was found bleeding profusely off the main road near the Kandi Bhavan this morning. A 22-year-old Army man was killed and two of his colleagues were injured when the autorickshaw they were riding collided head-on with a mini truck at the Poultry Farm roundabout early today. Both the vehicles overturned after the collision. City politicians campaigning for their parties in the Bihar Assembly elections scheduled for next month may not sound unusual. But if a criminal from the City Beautiful gets an offer to use his muscle power in the eastern state’s elections, it seems incredible. 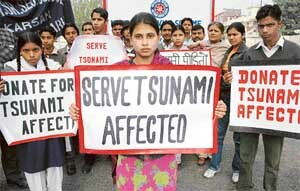 The Chandigarh Territorial Youth Congress today set up three relief collection tents in various sectors of the city to generate funds for tsunami victims. The local MP, Mr Pawan Bansal, visited one such tent in Sector 20 and appealed to the residents to donate liberally for the noble cause. Hundreds of visitors at the historic Nadda Sahib gurdwara here are facing a potential health hazard because of swarms of flies all around the area, courtesy the garbage dump site near the gurdwara. The flies have made life difficult for devotees. 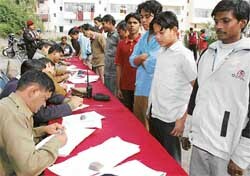 1,084 servants and 469 tenants were today registered at special camps organised by the Chandigarh police across the city. The registration of the two is mandatory under Section 144 of the CrPC and its failure may attract punishment under Section 188 of the CrPC. Domestic workers being registered at a police camp in Sector 20, Chandigarh, on Sunday. A human rights panel today complained to the UT Administrator against the torture of Bablu, a resident of Colony No 5, by the local police. In a representation to the Administrator, the panel alleged that cops of the Sector 34 police station wanted to implicate him in a “false” theft case. However, when he resisted their attempts, he was allegedly beaten up by them. Traffic on the Kalka-Ambala highway was disrupted for more than two hours after a truck got stuck after developing a snag in the middle of the Ghaggar river bridge in Bhankharpur village this afternoon. Chandigarh and its two cousins, Panchkula and Mohali, enjoy the reputation of being heartless areas inhabited by the great Indian middle class with the stiff upper lip. The Union Territory and the two towns comprise settlers from various parts of North India, primarily Punjab, who are insensitive to the neighbourhood concept, though sociability has slightly picked up as people, by and large, love to live life to its fullest. An animal welfare camp was organised by the Animal Husbandry Department Punjab at Sotal village in Kharar yesterday. According to a press note, as many as 235 animals were treated during the camp by a team of expert doctors. A federation of sector welfare associations felicitated Ms Anu Chatrath, Mayor, at its executive committee meeting here on Sunday. The UT Red Cross Society distributed woollens among the blind and the handicapped in the city on Friday and Saturday. The Akhil Bhartiya Brahmin Mahasabha today decided to fight social evils and build a new civilised world. During a meeting of the mahasabha held at Parshuram Bhavan here today, members from all over the country unanimously decided to remove the menace of dowry from the society. Mystery shrouds the death of a 35-year-old man at his house in Surajpur today. The victim, Raj Kumar, was employed as a driver with an Inspector General of Police. A 35-year-old rickshaw-puller is suspected to have died of excessive drinking on the New Year’s Eve in front of Saraswati Public School in Deria village. The Mohali police has arrested one person and seized 12 bottles of country-made liquor from his possession. According to the police, Chander Paul, alias Kalu, a resident of Banifer village in Chandigarh, was apprehended by ASI Kulbir Singh. They are serious about sound and if their company’s monthly sales, which are to the tune of Rs 40 lakh in India alone, are any indication, then UK-based OHM, dealing in manufacturing professional audio equipment, is earning big money by marketing the perfect sound to its clients. "Globalisation is the ideological justification of western capital economies to encourage among the Third World countries. Globalisation is not a spontaneous or natural force, it is a result of efforts of the capital economies to ensure that the rest of the world toes their line," said Dr S.L. 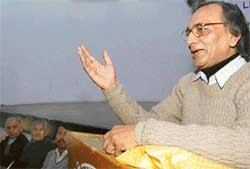 Sharma, former Head of the Department of Sociology, Panjab University. Following an order of the Punjab and Haryana High Court, the Punjab Nursing Council has given recognition to the R.N. Tagore Nursing Training Institute and Hospital at Pathankot and has ordered the migration of the first year and second year students back to the Institute. A two-day cultural festival organised in the memory of Dr M.S. Randhawa ended at Phase VIII parade ground today. Organised by the Punjabi Cultural and Welfare Society, Mohali, the festival ended with performances of a host of Punjabi pop and folk singers. S.C. Bhattacharya has yet again managed to say meaningful things with his cartoons. Famous for his art all over the country, the cartoonist loves to exhibit his works. It is, however, for the first time that he has managed sponsorship for his show. 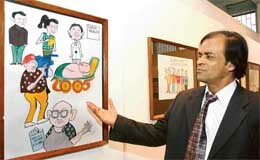 S.C. Bhattacharya with his cartoons displayed at Punjab Kala Bhavan in Sector 16, Chandigarh, on Sunday. The candlelight dinner was over. It was time for the pair to depart. The girl says good-bye softly and leaves for her home in a car with a smile on her lips. But the boy is sad while parting. He will probably miss her more. But do not be mistaken. Mr Balbir Tanha addresses a meeting of the Readers and Writers Society at Gandhi Smarak Bhavan in Sector 16, Chandigarh, on Sunday. Theatre, the most powerful medium to convey a message to people, was effectively used by volunteers of NSS unit of Punjab Engineering College in their endeavour to create awareness about prevailing social evils. Punjab Engineering College students stage a play on AIDS at Janata Colony in Naya Gaon near Chandigarh on Sunday. National Director of Bhaktivedanta College of Education, H.G. Shyam Hari Prabhu arrived in city today from Vrindaban to conduct a three-day-long seminar on “Transformation of hearts” at Hare Krishna Dham, Sector 36-B. The seminar will conclude on January 4. The British Library today organised a speech and drama workshop designed for the age group 10-14. This is for the first time that the Library has held a workshop of this kind for its teenaged members. The workshop, held in the morning and afternoon sessions, received a huge response. More than 500 patients were examined at a free medical check up camp organised by the Gurmat Prachar Seva Society, Bhabhat, in collaboration with the Lions Club Panchkula Central, district (321-A2), in Bhabhat village, near here today. A voluntary blood donation camp was jointly organised by the Shri Guru Granth Sahib Sewa Society, IMA Complex, Chandigarh, and a team of doctors from the Department of Immunohaematology and Blood transfusion of the Government Medical College and Hospital (GMCH) Sector 32 here today. Weightlifting Coaching Centre, Sector 42, bagged the team championship by securing 65 points in the 16th Senior Men and 6th Junior Boys Chandigarh Weightlifting Championship which concluded last evening at Sector 42. Public Sports Club, Sector 56, Chandigarh got the second place up with 31 points. 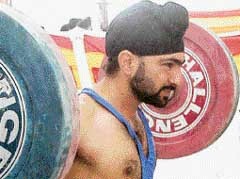 Navjot Singh at the 16th Chandigarh Weightlifting Championship in Sector 42, Chandigarh, on Sunday. The recent declaration by the United Nations to dedicate the year 2005 to sports and physical education has been welcomed by the local sports lovers. the UN has chosen sports to be the medium for peace and development in the world till 2015. The Estate Office has decided to introduce a computerised file tracking system with the assistance of the National Informatics Centre (NIC). The centre has developed a software for the purpose. This new service, which is likely to be introduced by February 2005, will reveal the status of the file and make the information available to the public. Terming the third amendment to the Indian Patent Act, 1970, through an ordinance by the Central Government as "anti-people and anti-national", the Punjab State Committee of the Centre of Indian Trade Unions (CITU) today decided to hold a convention on this issue here on January 29.